ESEOE Cold brew coffee can be referred that the unique flavor of coffee come from soaking the coarse coffee powder in ice water for long periods of time. Compare to ice drip coffee, it spend less time but it can effectively extract the beauty and essence of the coffee beans and remove the bitter and sour taste. ❤FIt also serve as ice teapot, fruit soaker or beer freezer. ❤Professional coffee desserts recipe. Our unique recipe can satisfy your taste for dessert and coffee. Combine with cold brew coffee, you also can make delicious coffee dessert even at home. ❤Our products are designed for cold brew coffee. Leak-proof lid features a excellent air tightness, our product not only can effectively prevent the leakage, it also can keep the air from entering to prevent oxidation and retain the original coffee flavor. ❤Calibration label. Our calibration label provides a combination statement of the quantity of coffee powder and water capacity. The instructions are very clear and simple. ❤Innovative shatter-proof coaster design. Compare with other cold brew coffee maker, we add a silicone coaster at the bottom of the maker to ensure your coffee maker's security. ❤Stainless steel dense mesh eyes. It's very dense and the filtered coffee juice will be the original flavor of the coffee itself so you can taste the real coffee. ❤Easy to clean. You just need to rinse it gently under the water. ❤The best gift. Our products with beautiful appearance is multifunctional. It can be used as a gift for your friends, relatives or colleagues. 1.It takes about 12 to 24 hours to brew. 2.The finished coffee grounds can be put into the fridge to absorb the smell. ☛The Best Choice For Coffee Lovers - ESEOE cold brew coffee maker is the perfect cold brewing system. Compared with other traditional cold brew coffee makers, it can reduce acidity by 60% per brew and retains the mellow taste of coffee. You can store or brew a variety of drinks, according to personal preference, to meet your different needs for iced drinks. ☛Reserve Oringal Flavor of Coffee- ESEOE cold brewed coffee maker has a strong airtight seal. By freezing your coffee for about 12 hours, the freshness of the coffee and concentrated flavor can be saved for up to 336 hours! ☛Higher Quality and Durability - Our aim is to provide customers best quality and service. 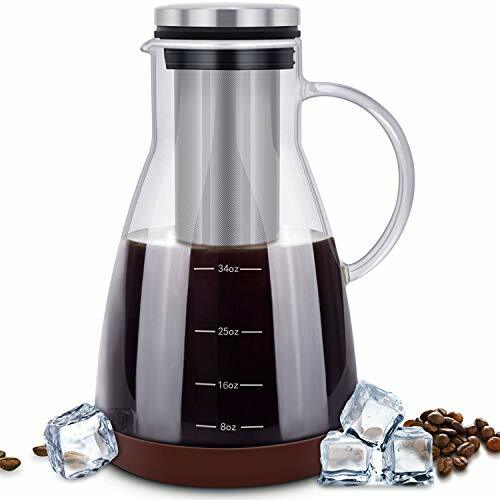 ESEOE cold brew coffee maker uses thick and durable borosilicate glass, making it more durable than others on the market. The precision stainless steel filter can remove residue completely, leaving only the most natural coffee flavor in the pot. ☛User Friendly Design and Operation - The handle and spout are designed to help you pour coffee easily and reduce accidental spills. Its compact and lightweight size fits into your fridge perfectly; the non-slip silicone coaster is designed to prevent breakage. Simply pour fresh coffee into the filter and soak it in water for 12-24 hours to enjoy the delicious results! ☛Product Guarantee- ESEOE glass cold brew coffee maker,we offer 180-day 100% satisfaction guarantee and life-time friendly customer service. If you have any questions or are not satisfied with the product, please contact us, we will help you solve the problem within 24 business hours. If you have any questions about this product by ESEOE, contact us by completing and submitting the form below. If you are looking for a specif part number, please include it with your message.